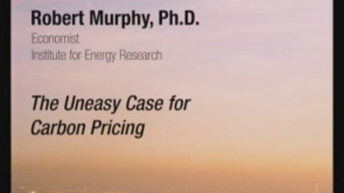 Robert P. Murphy is an economist with the Institute for Energy Research (IER) specializing in climate change. His research focuses on the proper discount rate to be used in cost-benefit analyses and the implications of structural uncertainty for policy solutions. After teaching at Hillsdale College for three years, Murphy moved to the financial sector to work as an analyst for Arthur Laffer (of Laffer Curve fame). In addition to his role at IER, Murphy is a financial consultant, providing forecasts on interest and exchange rates, growth, and inflation. He has written more than 100 articles for the layman on free-market economics and is the author of The Politically Incorrect Guide to Capitalism (Regnery 2007). Murphy has written study guides for the economic treatises of Murray Rothbard and Ludwig von Mises and designed a Home Study Course in Austrian School economics. He also has published several scholarly articles and notes in peer-reviewed journals.